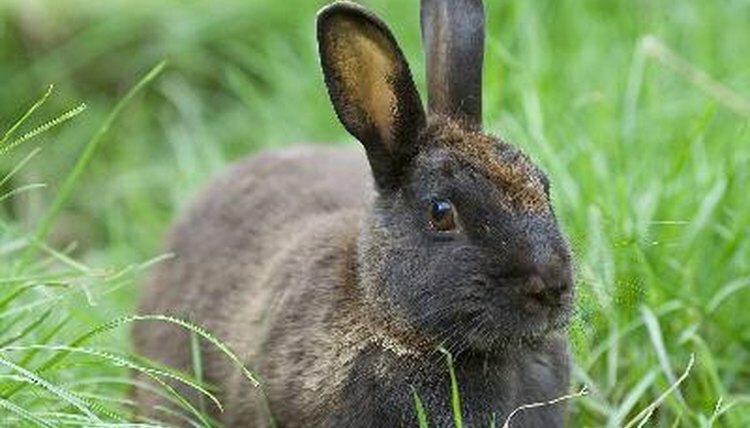 Holding and petting your pet rabbit is half the fun of having him, but you should be sure you are doing it correctly. If you do not pick up your rabbit the right way you could injure or scare him. Approach your rabbit's cage slowly so you do not startle him. Place one hand on your rabbit's head and lay the other hand gently on its back. This will help to calm your rabbit before you pick him up. Slide the hand that was on your rabbit's head under his body. Your forefinger should be between the rabbit's front legs. Do not grip the rabbit too tightly or you might startle him. Scoop your rabbit's bottom off the ground using your other hand and carefully bring him in to your chest. Cradle your rabbit against your body, supporting his weight with your hands. Sit down if you plan to hold your rabbit for an extended period of time.  Rabbits have a natural fear of leaving the ground so you should not be surprised if your rabbit struggles a little bit when you pick him up. Hold your rabbit securely and try kneeling down so he is not so far off the ground.  Be sure to hold your rabbit close, but do not squeeze him too hard or you could injure him accidentally. ⚠ Do not pick up your bunny by the ears or scruff of the neck as this may cause injury.